a.m. Cham, p.m. PJ « Alptitude! A morning in Chamonix was followed by an afternoon at Plaine Joux. Conditions were stable again, but enjoyable enough. Chamonix is always entertaining even if its not working particularly well. Just watching the speed riders coming in is one thing, and hearing them before you see them is another!! Yes, there were a few of them about today. Conditions weren’t enough to fly out, but certainly enough to maintain for a while. We decided to go to Chamonix this morning as the Brevant lift station is due to close on Sunday, so we thought we’d get a flight in beforehand. 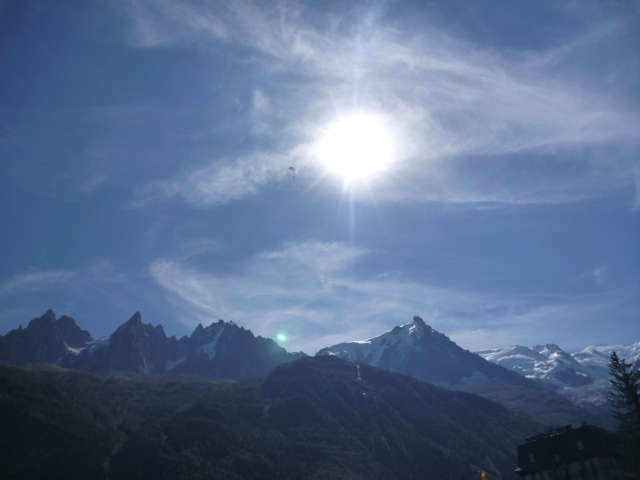 All is not lost though, as the Aiguille du Midi is still open so we can still fly there. This afternoon, we relocated to Plaine Joux, it was quite busy with the military out as well as Annecy Irwyn, with some guests. Roland was flying his speed wing, it turned out to be a merry throng up there. I was on driving duty, and Dennis was awaiting a delivery of winter fuel in the shape of logs to arrive. Alistair, our guest had a good flight, making the most of what he could muster out of the inverted air, mild thermals and cooling temperatures. He managed a prolonged flight though….. Tomorrow is looking ok although, there is some deterioration forecast towards the weekend… we’ll see.